Hi Friends! Lunar New Year is approaching and I am posting what to do with leftovers already. Not to rush your Lunar New Year’s festivities but if you’re like me, you make mountains of food for Lunar New Year and then have a ton of leftovers. No one wants to waste food but recycling leftovers creatively does require a bit of planning ahead. Fortunately, there are some really great dishes to reuse New Year’s leftovers like this recipe. Pickled Mustard Greens, usually served as a side dish with many New Year’s dishes, gets to enjoy the spot light in this soup dish. 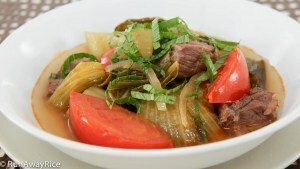 The tart mustard greens combined with tender beef shank and tomatoes in a flavorful broth is so scrumptious and hearty. Enjoy the recipe and feel good about not wasting food! Beef shank is a tougher cut of meat and needs to be cooked slowly in order to be tender. You can cut the beef into thin slices to reduce the cooking time. Alternatively, you can use beef or pork short ribs. Be sure to remove the connective tissue surrounding the shank. It’s too tough to eat. Use any stock you like. I love a lighter stock with this soup so I use chicken but beef is just as good too. When measuring the Pickled Mustard Greens, don’t include any of the pickling liquid, it will make the soup too tart. 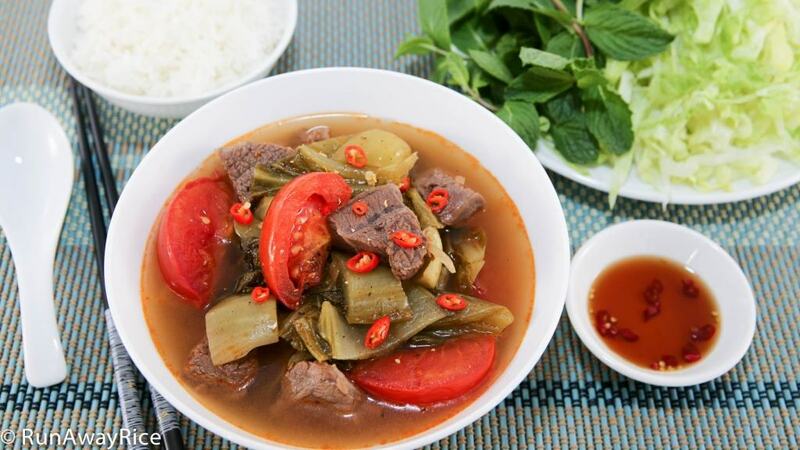 If you enjoyed this recipe you may also like: Sweet and Sour Pork Ribs (Suon Xao Chua Ngot), Sweet and Sour Pork Ribs (Suon Xao Chua Ngot) and Sour Soup with Fish (Canh Chua Ca). Finely dice the onions. Cut each tomato into 8 wedges. Cut the meat around the bone to remove it but do not discard the bone. Trim off the connective tissue surrounding the beef shank and discard. Cut the beef shank into 1-inch cubes. Heat a pot of Medium High heat and when hot add 1/2 Tbsp vegetable oil. Add 1/2 of the diced onions and stir-fry for 15 seconds. Add the beef shank and bones and stir-fry until the meat is just slightly pink, approximately 2-3 minutes. Add the water and salt and stir together. Cover the pot and bring to a boil. Skim off the foam until the broth is clear. Add the chicken or beef stock, cover and bring to a boil again. Skim off the foam once again. Reduce the heat to Low and cook for 1 hour or until the meat is tender. Heat a skillet over Medium High heat and when hot, add 1/2 Tbsp vegetable oil. Add the remainder of the diced onions ad stir-fry for 15 seconds. Add the tomato paste and stir-fry for 30 seconds. Add the tomatoes and stir-fry for 1 minute. Remove from the heat and set aside for now. Remove the bones from the soup. Add the pickled mustard greens. Cover and cook on Medium heat for 10 minutes or until the mustard greens are tender. Add the tomatoes and gently mix into the soup. Season with fish sauce and combine together. Cook for another minute or until tomatoes are tender. Add freshly ground black pepper. Serve with with a plate of shredded lettuce and fresh mint along with fish sauce and sliced red chilies. When I pulled the leftover canh out of the refrigerator today, I was pleasantly surprised to find that the broth had gelled overnight. I will most likely make this recipe again in the pressure cooker. The gel is sign of a rich and flavorful broth! Delicious! Hi, Trang. I made the canh today and it was good. The aroma and flavor emanating from the soup reminded me of my childhood. I quickly boiled and rinsed the beef shanks prior to pressure cooking. I decided to add the pickled mustard greens along with the tomatoes and remaining onions. I served it with thin rice vermicelli. Thanks again for another wonderful recipe. Hello, Trang. Love your blog. Any thoughts on how to covert this recipe for the Instant Pot? Thanks in advance.